I gazed at the irregular dark grey Rocks; and tears filled my eyes. And as the people with whom I had travelled bade me good-bye to follow the guide who had come to take them round, I was glad: I wished to see the Rocks without haste and, as far as possible, alone. Right before me stood the highest rock; a long, rough cylinder -- or rather, a prism -- of stone, very slightly inclined to the left like the trunk of an enormous tree that time had worn and human beings mutilated, without being able to destroy it. I knew that, at the top of that rock is the sanctuary from which the wise ones of old used to greet the Earliest Sunrise, on the morning of the Summer Solstice Day. 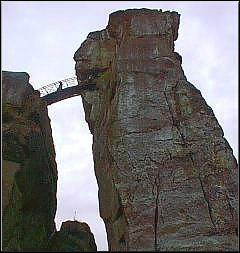 From below, I could see the bridge by which one accedes to it to-day -- the bridge that now joins the highest rock, commonly called "the second," to the next one on the left, commonly called the "third" (called so, at least, in the one detailed archaeological study which I had, up till then, read, concerning the Externsteine). Slowly I walked up the stairs hewn into the live rock on the side of the "third" cliff, halting now and then to admire the landscape over which, my eyes wandered, from a little higher at every new step I took: the small lake into the still waters of which the furthermost cliff to the right -- the "first" -- plunges vertically; the thick woods beyond; the extension of the road by which I had come, past the slope on the left and past the lake, into further woods; and, on the other side -- to the north-east, whence I had come -- the wooded hills around and beyond Horn and Detmold. In the sunset glow, the reds in the autumn forest appeared brighter, and the browns, redder. And the lake was a smooth surface of shining darkness and bright orange-gold, on the opposite side of which I could see the up-side-down reflexion of the forest. I went up and up and, having crossed the bridge without daring to throw a glance into the void below, I found myself standing in the age-old sanctuary that I had come to behold. And I shuddered, overwhelmed at the feeling of being on holy ground. It is difficult to tell what the sanctuary once looked like. To-day, nearly twelve hundred years after its systematic destruction through Christian fanaticism, one steps onto a stone pavement some six yards long and not quite four yards wide, without a roof. At one end of the room, to one's right as one now comes in, i.e., to the North-East, one sees a huge piece of rock -- a part of the very cliff on which one is standing -- carved out into a vaulted hollow, the ground-level of which is a foot higher than the pavement. 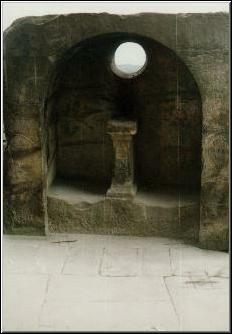 In the midst of it, hewn out of the same one block of stone, is a stand, with a flat, table-like top about a foot wide and two and a half feet deep; and above this, cut out in the solid, natural, north-eastern wall of the mysterious room, an opening, as perfectly circular as can be, something over a foot (37 centimetres, exactly) in diameter. At the other end of the pavement -- to one's left as one enters, from the bridge, i.e. to the south-west -- is a rectangular niche, higher than even a very tall man, some five feet broad or so and over a foot deep, with a pillar each side of it. And in the rock wall opposite the bridge -- to the north-west -- is a window looking over the neighbouring cliff and the lake beyond. The once existing walls between the vaulted room and the rest of the structure, on the south-east and the north-west, are now replaced by iron railings. 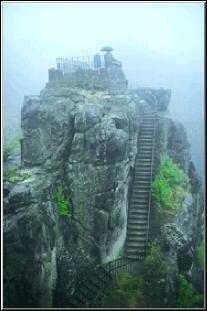 The roof of the sanctuary was the eastern portion of the top of the cliff itself. It has been destroyed, leaving the whole place, with the exception of the vaulted hollow, as I have said, open to the sky. 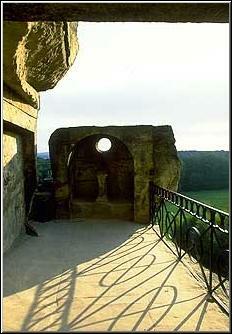 What is left of the Chamber of the Sun, at the summit of the Externsteine. My back to the south-western wall, behind which the Sun was now setting, I gazed at the ruins of the venerable high-place. Here, at the time the great Egyptian kings of the Twelfth Dynasty were building their mighty temples and ever-lasting tombs; at the time the mysterious sea-lords of "Middle Minoan II" ruled Crete and the Aegean Isles; before the earliest dated Aryan conquests in the East -- four thousand years ago and more -- the wise men, spiritual leaders of the Germanic tribes, and guardians of the natural Values that made their lives worth living, would gather, and greet the Earliest Sun-rise, on the sacred Day, in June. In the midst of the stand in the vaulted chamber, one can still see a square socket. There used to be a rod stuck into it, the summit of which was on a straight line both with the lowest spot on the brim of the round opening in the north-eastern wall, and a spot in the middle of the niche against which I was standing -- the Solstice-line, running North-east South-west. So that, when the rising Sun would appear exactly at the lowest brim of the round stone opening, and, at the same time, exactly behind the upper extremity of the rod, to an observer standing in a rigorously determined place in the middle of the niche, then one could say, with certainty, that it was the Summer Solstice Day, on the correct detection of which the whole calender -- and, subsequently, the festivals, and the whole life of the community -- was dependent. For a few days before and a few days after the Summer Solstice, the rising Orb would appear within a certain radius, on the side brim of the round opening. The spot ot its appearing would seem to travel, from a place on the side of the circle down to the lowest section of it, and up again. The wise men used to watch it day after day, in order to make out when, exactly, the earliest Sunrise -- the Sunrise rigorously according to the unchanging Solstice-line -- would be. And as they saw it -- one spot of intensely bright gold on the rim of the circular opening; one ray of light into the dark chamber -- they would shout from the top of this rock the spell of victory announcing the beginning ot the great Summer festivity to the people assembled below: "Siege, Light" -- "Triumph, Light." I thought of this, which I had read, and which I had been told by modern Germans faithful to the old solar Wisdom; Germans who had gone back to it, in an unexpected way, through that modern Faith in Blood and Soil -- that Aryan Faith: National Socialism -- that binds me to them. I thought of this, and imagined, or tried to imagine, the solemn scenes that have taken place, year after year, upon this rock, for centuries, nay, millenniums; scenes of which the regularity had seemed eternal like that of the reappearing of the sacred Days. And I thought of the abrupt end of the Cult of Light; of the destruction of this most holy place of ancient Germany by Charlemagne and his fanatical Frankish Christians. I pictured myself half the top of the Rock -- which had once been the root of this sanctuary -- violently split from the rest of it and thrown down there, where its fragments can still be seen: the desecrated holy room; the persecuted holy Land, on whose people the foreign creed of false meekness, of which they are, even to-day, not yet free, was forced by fire and sword. I pictured myself the Frankish soldiery -- men of Germanic blood, "crusaders to Germany" in the name of a foreign prophet and of a foreign earthly power -- storming these hallowed Rocks; killing whomever they found; setting fire to whatever would burn; through terror, preparing the way for the new teachers: the monks, true "re-educators of Germany" in the worst sense of that much-detested word, who would (if they could) stamp out every spark of the old solar Wisdom -- of Aryan wisdom -- in its main European Stronghold. This had happened in the year 772 of the Christian era -- one thousand one hundred and eighty-one years before. But how tragically modern it all looked! These very first "crusaders to Germany" appeared to me, more vividly than ever, as the forerunners of Eisenhower's sinister "crusaders to Europe." They had fought in the name of the self-same hated Christian values, ultimately for the triumph of the self-same international power, both temporal and spiritual -- the Church -- which was, and still is, the power of Jewry in disguise. They had fought against the self-same everlasting values of Germanic Heathendom -- the natural, heroic religion of the noblest people of the West, in which, both then and now, the Aryan Soul has found its most accurate expression on this continent. And they had persecuted them with similar savagery, and still greater efficiency, perhaps; with similar, and even greater, Germanic thoroughness. And I remembered that Eisenhower (a curse upon him!) is also of German descent. And once more I hated the madness that has, so many times in the course of history, thrown people of the same good Nordic blood into fratricidal wars for the sake the childish superstitions which the Jews -- and their willing or unwilling agents -- have put into their heads without them even suspecting it. And as the picture of the destruction of the old religion and of the christianization of Germany, not merely in all its cruelty, but in all its thoroughness imposed itself more tragically upon me, I realised -- not for the first time, but yet, perhaps more intensely than ever before -- that the main dates of Charlemagne's war against the Saxons, 772 and 787, are, from the German and, which is more, from the broader Aryan standpoint, even worse than 1945. For the stamp of the foreign creed, and specially of the foreign, anti-natural, anti-racial scale of values, is visible to this day in all but a minority of Germans; in all but an even smaller minority of Europeans. The spirit of the healthy Aryan warrior and sage -- the spirit of detached violence for the sake of duty alone; our spirit -- took over a thousand years to re-assert itself through a proper doctrine of German inspiration, in a German élite, after the disaster inflicted, then, upon those who expressed it. While in spite of enormous losses and no end of suffering we -- the National Socialist minority; the modern Aryan Heathen -- have survived this disaster; survived it, with our burning faith and our will to begin again. And we shall not need a thousand years, nor even a hundred, nor even ten (if circumstances be favourable) to rise once more to power. It may be that the new world we were building lies -- for the time being -- in ruins, at our victors' feet. But our Weltanschauung is intact within our hearts. And there are younger ones ready to carry on our work, when we shall be dead; younger ones who shall, one day, defy Germany's "reeducators" and their programme, and their teaching and their spirit, even if an angry time denies them the pleasure of killing their persons. At the thought of this, I felt elated. I looked round me, at the lonely, desecrated sanctuary; above me, at the overhanging, slanting rock, from which the massive monolithic root had been violently rent, nearly twelve hundred years before -- the permanent scar left by the first "crusaders to Germany" upon this high altar of the national cult of Light. And in a flash I recalled my own life-long struggle against the Christian plague -- in Greece, in the name of destroyed Hellenism; in India, in the name of unbroken Hindu Tradition; everywhere in the name of Aryan pride and Nature's truth. And I imagined the similar part I would like to play, here. among my Führer's people, after the re-installation of the National Socialist New Order, one day, never mind when. "Yes, we are alive," thought I, full of self-confidence and full of confidence in the German minority that thinks and feels as I do. "Defeat has not killed us; it has only made us a little bitterer and still a little more ruthless. One day we will avenge you, wounded Rocks that have been calling us for so long, and you, our elder brothers, warriors who died defending the approaches of this high-place! Wherever I be when our Day dawns, may the heavenly Powers grant me to come back, and take an active part in the revenge!" The preceding text is from the final chapter of Devi's Pilgrimage (Calcutta, 1958), an account of her clandestine visit to occupied Germany in 1953. A few obvious typographical errors have been corrected.